I swear we were just in school. This summer has been one of the fastest ones yet, and it seems like the years keep getting shorter and shorter. Nevertheless, here I am, beginning a new school year with 52 kids and my co-teacher. I have 2 classes of students, teaching reading, writing, and language arts. 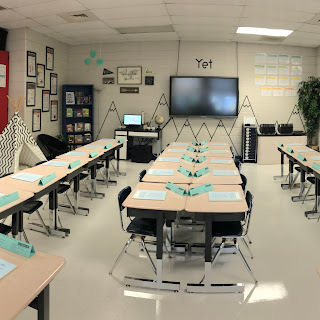 This is my third year in 5th grade and in this classroom. I wanted to give you a little look into my classroom and how I'll be running some things this year. Some of these ideas are new and some are oldies but goodies. If you have any questions about anything, just let me know in the comments! First and foremost, I have always loved having my students in a U-shape or something similar to this. 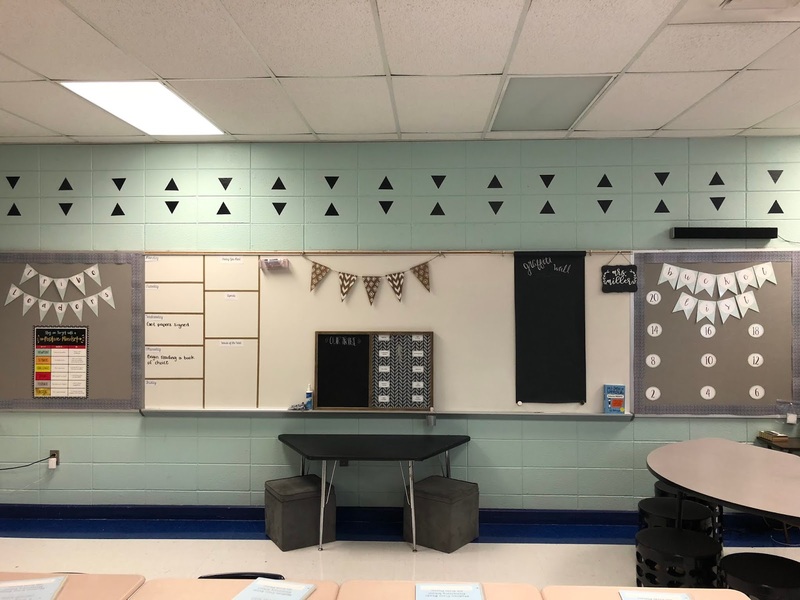 I have tried, and probably will try again this year, all different styles but nothing beats this layout and my students always ask for this, too. It really allows for everyone to be apart of our conversations by being able to look at each other and no one is on an island this way. The mountains that you can see (which a student asked if they were mountains or pencils. They're definitely suppose to be mountains! I tried..) are made from washi tape. Electrical tape did not work on the type of walls we have, but this has held up great! 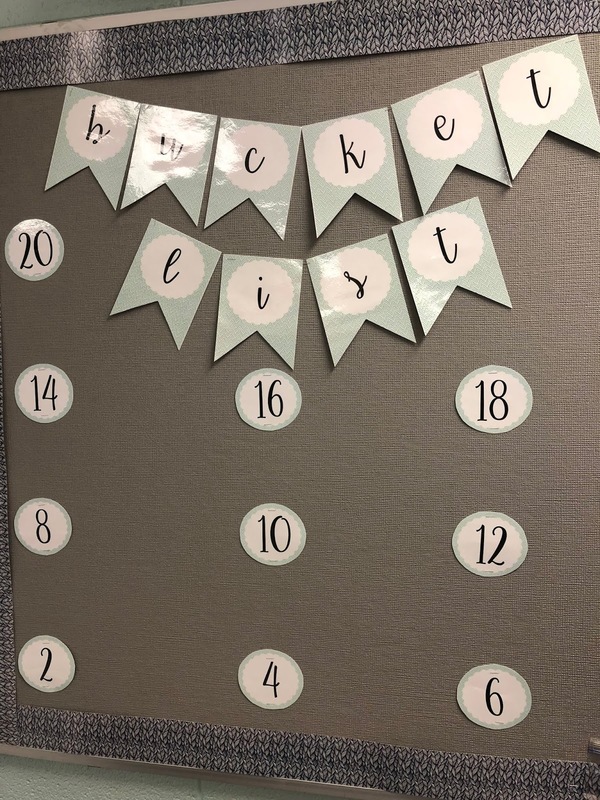 I have "YET" posted for my students to see everyday because I believe in the power of yet. It's a shift in words to allow them to continue to work on a hard task. Example: I don't know how to do this... yet. A closer look at the front of the room shows my stage that I adore! 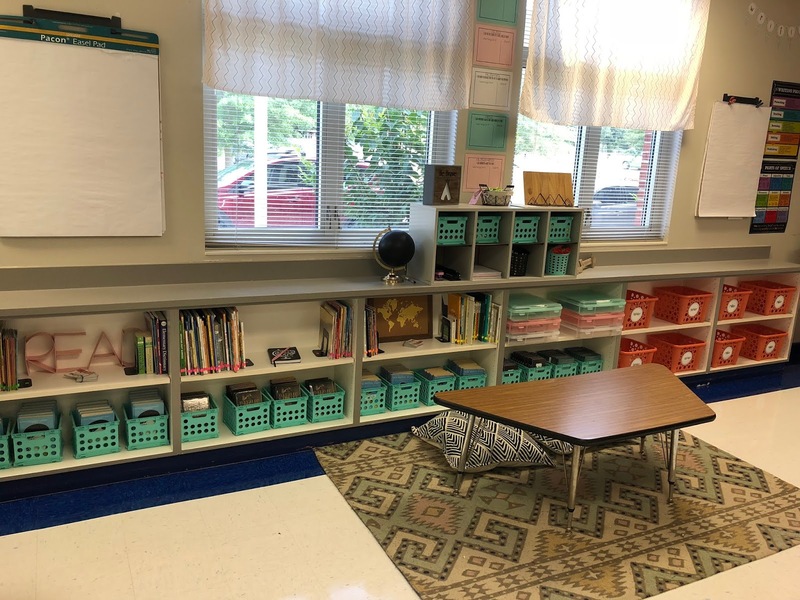 My husband made it for me and it's actually a storage stage where I'm able to put all of my classroom transformation supplies in. I also have the word "because" inspired by Jen Jones. She says, "It's the one word that can lead to higher order thinking," and if we have students to explain their answer using "because" we allow them to justify their thinking and other students can follow and engage in their thinking. Go check out her story on Instagram because it's powerful! I also have my desk here in the front that isn't really a desk but more of a my computer set up for the board. 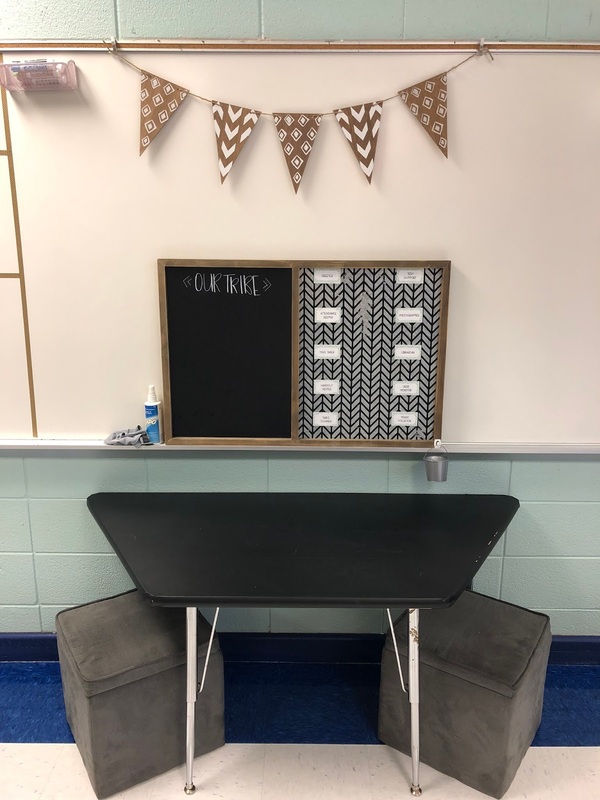 I also have my students turn in tray at the front next to their Chromebook charging station. (It's the navy bins on the rolling cart. These were originally multi-color which is what you will find, but I spray painted them 3 years ago and they still look great!) In a previous post, I explained setting up a classroom in a way so students aren't walking all around the room to prepare/leave for the day. 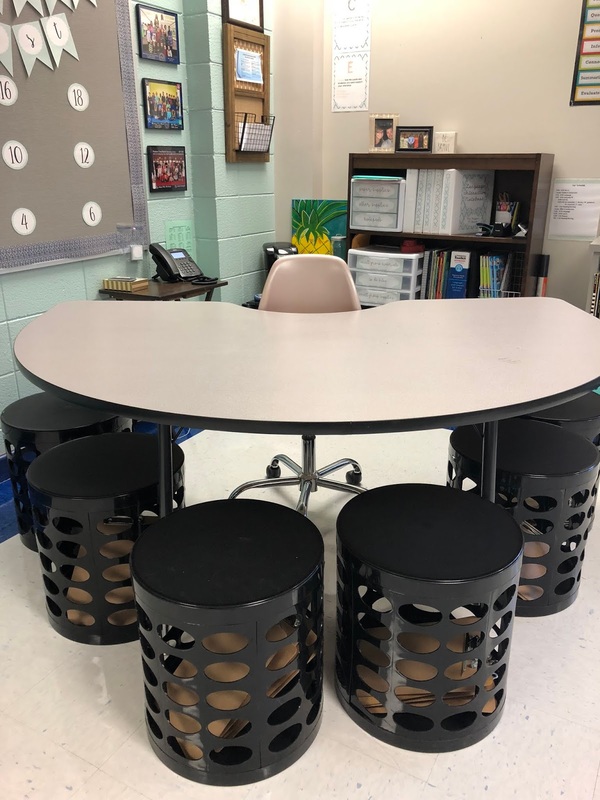 It allows for better classroom management and makes the flow of the room better. The door is right beside this so it makes exiting smooth. 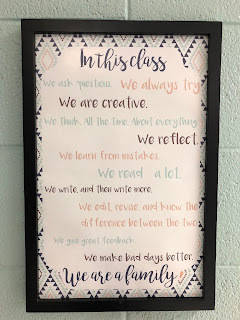 By the door, I have "In this class" posted for my students to remember what we're all about. The biggest thing I like for them to remember is that we are a family. My students last year started to say, "hashtag Miller fam" because I build this up so much in my room. It's important for all of us to see this each day. On top of my turn in tray is our classroom mission statement. This is what I want my students to remember everyday! They are working to build themselves to be proud of who they are. I also have my mic there, which the kids are anxiously waiting to use! 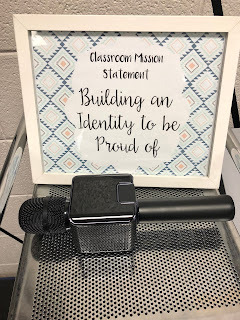 I got this mic on Black Friday from Walmart for $10 before it was really popular to use these in the classroom. I've seen some more expensive and fancier looking ones floating around on Amazon, but I like mine just fine. 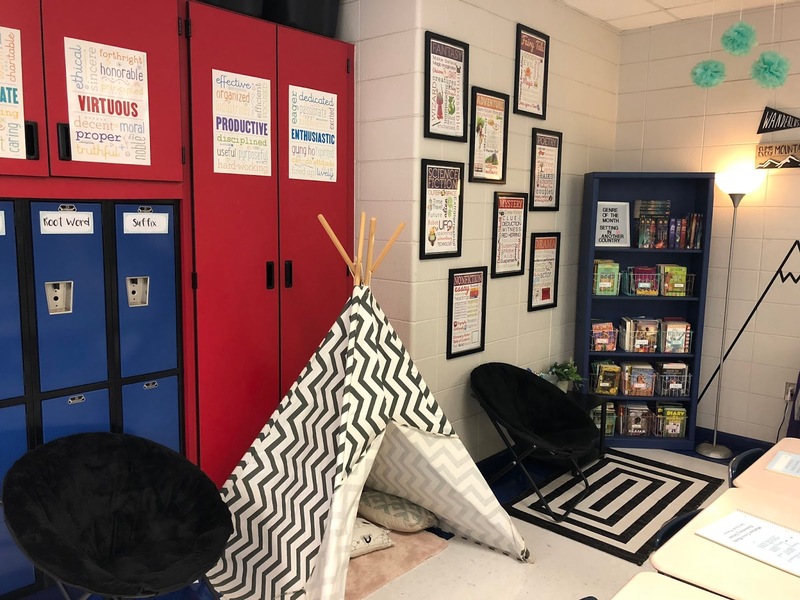 My reading nook is my favorite place in my classroom! I have different genres posted on the wall because genre reading is what I focus on in my classroom, not A.R. points. I also have different types of chairs and the teepee for kids to sit in. They seem to always love having a variety of options. I got almost all of my supplies here from Target, except the teepee came from Hobby Lobby. In the back of the room is my other library area and optional seating. The rug and pillows are from Target and the book bins are from Walmart. 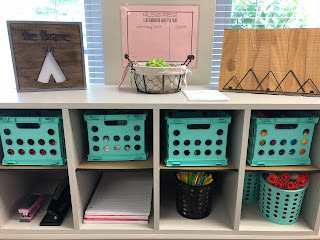 This is also where I place our anchor charts for reading and language/writing. The holders for the chart paper are from Amazon and have been my sturdy friends for years now! 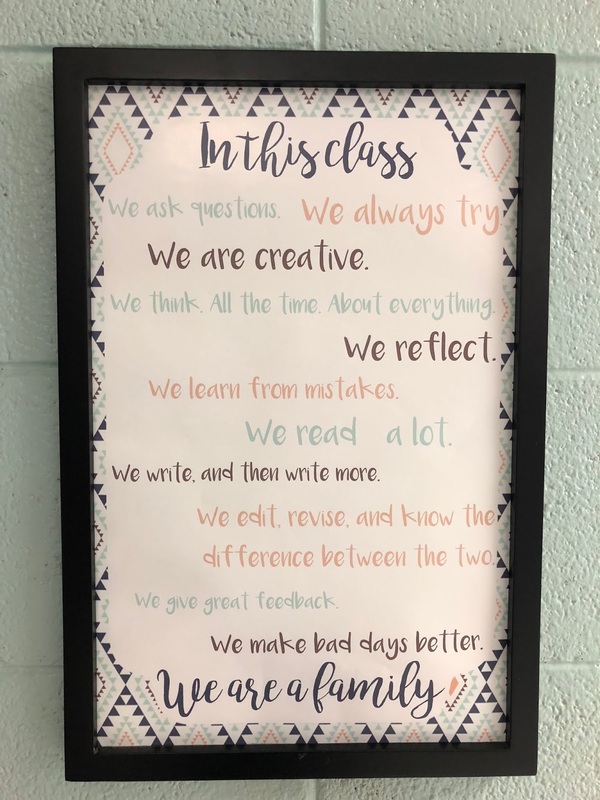 It's one of the best buys I've ever made for my classroom. A little closer look at this shelf, this is where I hold all student supplies. The kids are welcome to any of these as it's needed. It does get abused sometimes, but being in a Title I school, I know some students need access to supplies that their parents can't get for them. The mountain frame is from Hobby Lobby and I'll add our class picture in there when we get those in the winter. The shelf is from Amazon and I absolutely love this thing! I've used it for all sorts of things in my room (see previous post), but it's currently our supply area. Stepping back from the supply area, on the wall you can see my essential standards and center boxes. 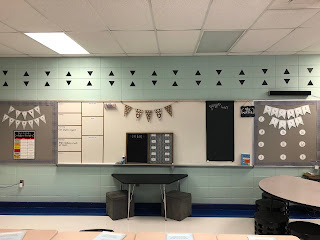 To read all about how I'm doing my centers and what are essential standards, check out my previous post. It is a lot to explain on this post, but it's very important to how my classroom will function this year. I am lucky enough to be able to paint my walls. My first year in the room, I painted this wall because it was where my smart board used to be. 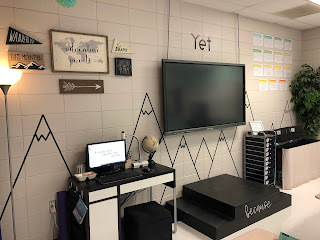 At the end of last year, it was moved to the other wall (in the first photo) so I've made adjustments to my classroom since. On the left, you'll see "Tribe Leaders" which will be where I feature class work. On the white board, I have the week's plans that the students will write in their planners every Monday. I also have "What You Need" and "Agenda" which I change out every day. They look at the board when they walk in and grab the appropriate supplies without being told. They also know exactly what will be discussed that day, too. I brought this idea with me from PreK because students want to know what is happening that day, just like we want to know when we go into a meeting. It also helps me stay on track. Moving on over, I have a board from Hobby Lobby that features our Polaroid pictures we take throughout the year and then class jobs. This used to be my library list for the kids to sign up to go to the library, but we have that as a special this year so they will go as a class now. It's my first year doing class jobs so I'm interested to see how it goes. They had to apply for the position and I assign it to them for the whole year. I'm hoping it eliminates the questions I'm always asked. This table is actually my school's, but I've covered it with black contact paper. It just ties in the color of my room better. The grey stools came from Target, which they have on sale once the college/back to school supplies come out. I've had those for 3 years and they are still just as good as the first day I bought them. Next on my board is the Graffiti Wall. This is where my students can write quotes from their books as they find something they want to share. 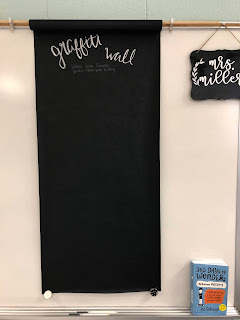 This is new for me so I'm hoping the kids like the idea as much as I do. My small group table is back here as well. These stools were purchased last year from Otto Storage and are VERY durable! The tops come off so you can store things inside, which I have put clipboards in them so my kids can easily access them whenever they need them. 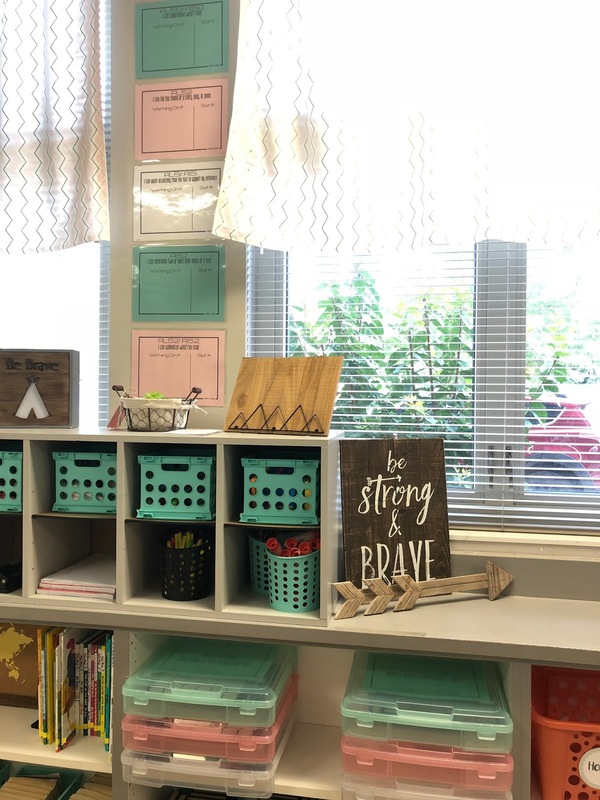 I don't have a teacher desk, by choice, so I have a bookshelf that holds all of my supplies. I've always used some sort of storage like this and have loved it. I also have a TV tray that I put my laptop and school phone on. I've been using that bad boy since my first year of teaching and still love having a little spot to set my stuff while I'm working with kids. Beside my small group table is my "Bucket List" tracker. The Bucket List is a product I bought from Hope King and Adam Dovico and changed a little. I set a goal for my students to read 20 books by the end of the school year in a variety of genres. Again, I'm not focused on A.R. because that doesn't build a love for reading. I'm focused on building a love for reading which I believe this program does. When I conference with my students about their reading, I also check to see how close they are to their goal. Then I post their names on how many books they've read and move it up as they get more. They love to see who has gotten to 20! This year, I am doing "Mindfulness Monday" with my students. A relaxed classroom is definitely my style of teaching. 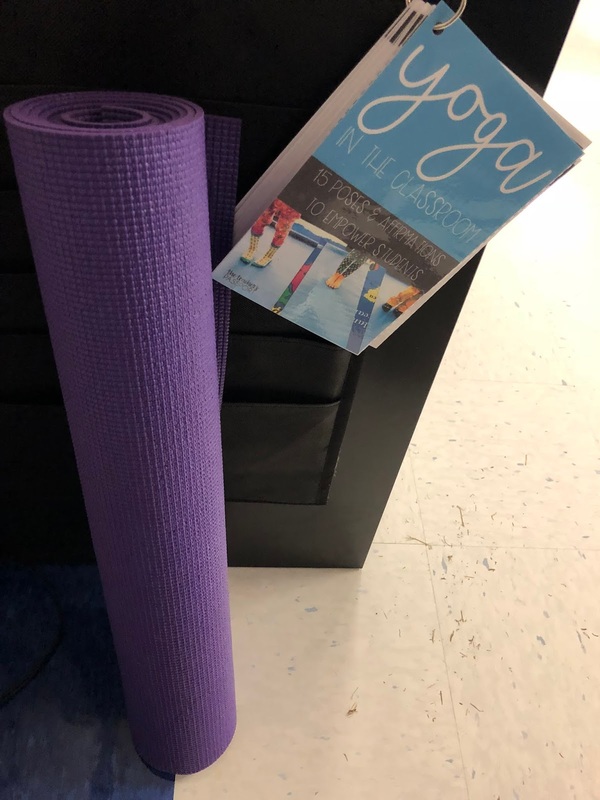 I think these tools from The Teacher's Passport will help get me started on getting myself and my students to a more mindful being. 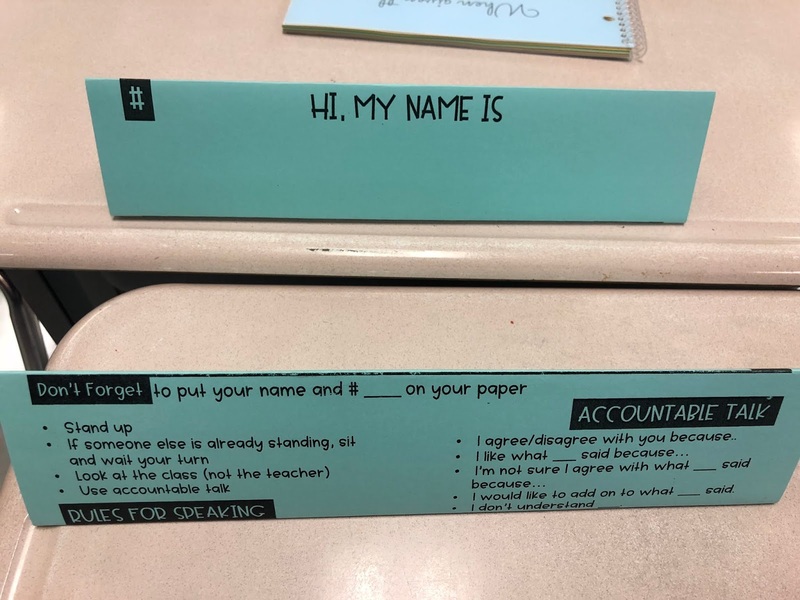 One final thing I want to show you, because I've gotten questions about this on Instagram, are these name tags. 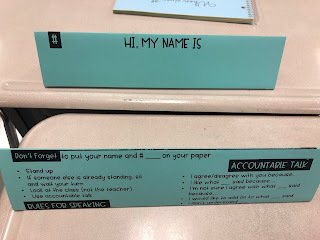 On the front is their name so I can see it, but on the back are resources for them to use. I'm beginning my year with these to enhance classroom listening and speaking rules. I will change them out as I introduce new topics and want them to have new resources. I have them available in my store and they're editable for you to use! I hope you enjoyed taking a look around my room! 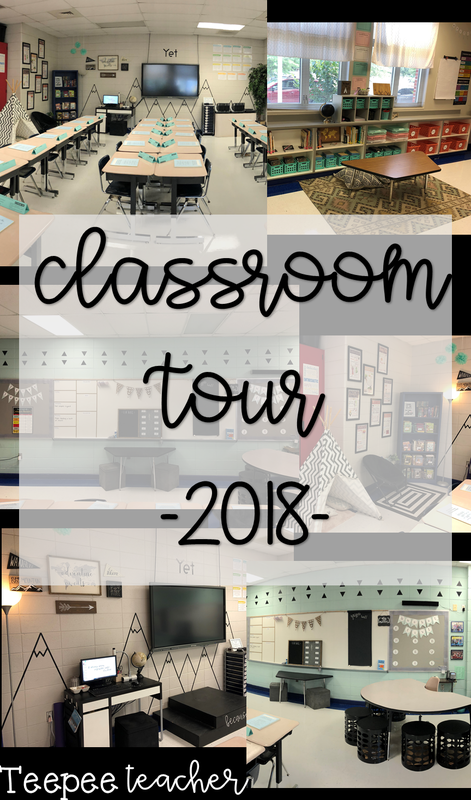 There are so many details in making a classroom work for you and your students. It's your home away from home and should be something that makes you happy! I've had this theme for 3 years now and not looking to change it anytime soon so I've collected items throughout the years and still working to make it better and my style. Some years certain things work and some years I have to completely change the set up. If you're working on your room and looking at mine like I have it all figured out, know that I don't, but I'm flexible to change and adapt to my students. Steal any ideas you gathered from here and let me know if there's something you think I could incorporate! Sweetest comment ever!! I sure wish they helped! 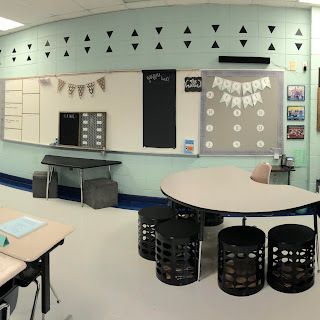 I love your classroom colors! It's very calm and clean. The teepee represents community and collaboration that leads to success. I believe this is the only way to have a functioning classroom, school, and education system.